Bollywoo: Is New Media Killing Star Power? Is New Media Killing Star Power? Over the last few years I have noticed star power diminish from the silver screen. By star power I don’t mean the power an actor has to pull audiences into the cinema hall, I mean the power a movie star has when they perform. You watch a film and you relate to the character, he/she draws you into the film and entertains you for a couple of hours; you forget your troubles and enjoy their company. The problem with today's films is they seem too unreal and fake because we know too much about the personal lives of the actors! The more we learn about them off screen the less believable they become on screen. Interactive Public Relations such as blogging and social media sites like FaceBook and Twitter are actually hurting the Film Industry rather than helping it. More and more movie stars are getting into the new Interactive PR and multiplexes are opening all across the nation yet Box-office collections are at an all-time low. In the first 10 months of 2010 the film industry has already incurred losses of over 250 crores thanks in a large part to the debacle of Rann, My Name Is Khan, Prince, Lamhaa, Kites, Action Replayy, Khatta Meetha, We Are Family, Anjaana Anjaani, Robot, Jhootha Hi Sahi, Hisss, Knock Out, Raavan, etc. - all expensive films which failed to click at the box office. The problem with new media is it over exposes films and the people involved in making the films. Even before a films release people know everything about its story, its production and even the characters. And what you may not know is revealed to you by film critics the day the film releases. Once we know what the story and characters are about why would anyone pay Rs. 200-250 to go see it. A perfect example is Guzaarish, when I first watched the promos of the film, I thought “what a piece of crap” – I could tell everything was blue screened – the entire film looks like it’s been made inside a studio – even the locations and sets look fake. Aishwarya Rai looks like she’s trying to hard and overacts in most scenes. The bit with the fly on Hrithik Roshan’s nose reminds me of the final scene from Alfred Hitchcock's Psycho. Not just me, the promos failed to generated interest among the public as well and the opening days collection of Guzaarish were a mere 4.5 crores and will likely go down as the week progresses, it’s doubtful the film will generate more than 20-25 crores at the box office during its life span. 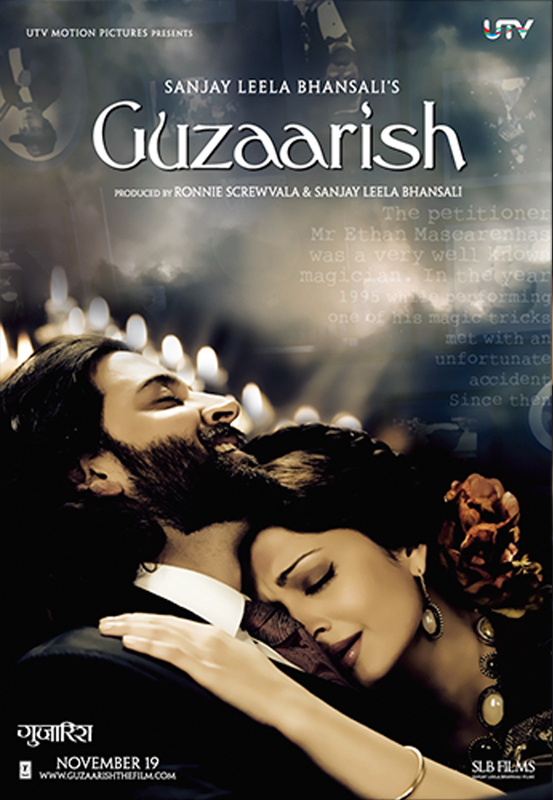 Considering Guzaarish had a budget of 80 crores, it will only add to an already woeful year. It used to be that a movie star always seemed out of reach and what we saw of them on screen made us admire and respect them for what they were able to pull off. But when we know more about them than we do our own families, the star appeal disappears because now they’re like our family members and not someone we thought was out of reach. We can pick on every little thing they do, we know how they react to every situation, so when they do something on screen which is different than who we know them as, it seems fake and unbelievable. No matter how hard they try we just don’t buy it anymore! Film Festivals or Social Networking?